As an avid chef or Angler, you ought to know that preparing fish can be a huge task especially when you’re not using the right tools. Hence, to get this done comfortably and have a feeling of accomplishment, a fillet knife has to come in handy. This tool is essential for preparing and filleting fish. They come in different types and sizes to make the filleting task an exciting one. Some of these knives are slim, flexible and have a long sharp thin blade which enables it to maneuver easily and cut through fish bones. To allow for a firm grip while filleting, some comes with a rubber graspable handle to make the process of slicing and dicing a lot easier and quicker. Today, there are countless options to choose from on the market, which makes it challenging to get the right one that will be worth the price and serve your specific needs. So, to ease your stress, we have put together some sincere reviews of the best fillet knives and buying guides to help you make the right purchase. Having a good fillet knife is as important as a good rod when it comes to fishing. But getting the right one to serve your needs can be a daunting task since there are many of these fillet knives on the market. Well, not to worry, because after reading this buying guide you’ll certainly find it easier to choose a suitable one that will suit your specific needs. Here are some very important things to consider when shopping for one. The blade is one of the most important parts of a quality fillet knife, as it determines how smooth the cut will be right through the fish. It's very important you keep in mind the following points in blade selection so that you get the right knife for your specific needs. The blade material: A blade made of corrosion resistant alloy will definitely last longer even when used in a salty environment or salt water. And a perfect material of this blade is one made with corrosion –free stainless steel or titanium. Blade size: This comes in various sizes between 4 to 9 inches. The size of blade you need depends on the type and size of the fish you usually work with. For larger fish, it is required you use larger sized blades as this will help to get the job done easily. Shorter blades will work great when used for smaller fish like crappie. Thinness and sharpness: This is one characteristic to look out for as this can play an essential role in determining how smooth and clean your cut will be right through the fish without leaving any rough edges behind. As you should know, the thinness of a blade matters a lot since thicker ones require a lot of effort to cut through the fish and bone. As well as the size and thinness of the blade, you will also want to consider the strength. A Flexible blade will make a lot of difference when used for removing bones. But they are not suitable for slicing larger fish due to its flexibility and less strength. Instead, a thicker one is preferable. Fillet knives come in different variety of handles, and having one that offers a comfortable grip will make the slicing a lot easier and quicker even when used with your wet hands. Like other types of knives, the popular options are the ones made of traditional wood, rubber or plastic. But whichever one you plan to buy always make sure that it fits your hand and it is comfortable to hold while filleting and boning. An electric knife is a suitable choice if you’re finding a quicker way to fillet a lot of fish after a great catch. The electric types are either corded or cordless. The corded types require you to connect it to a power source when using it while cordless types come with a rechargeable battery. Most electric types offer an opportunity to change the blades for different cutting purposes; this means you don’t need to worry about getting several knives for different types of fish and sizes. In most cases, your budget will determine whether to get one that is expensive or cheap. But from experience, the expensive ones are usually made with high-quality material which makes it durable and long-lasting. However, by reading the product reviews carefully you should be able to get one with sound quality that will also suit your budget. For a satisfactory benefit, this is one of the essential things you have to check when shopping for your knife. This warranty in most cases ranges from a minimum of 1 year to a lifetime. There are many in the market which come with a limited warranty but it is best you get one that offers a lifetime warranty against defect. 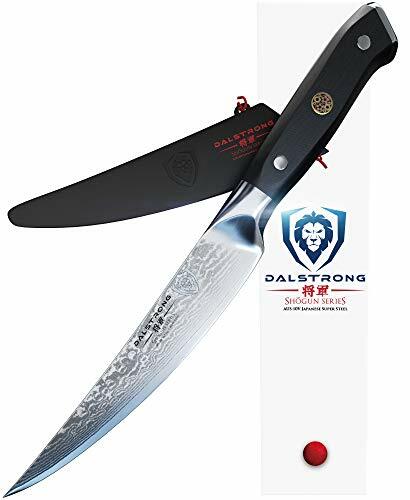 This ultra-sharp Japanese fillet knife from Dalstrong is made with premium carbon stainless steel for remarkable strength, durability and stain resistance. It features a 6’’ inch blade with 2.00 mm thickness which provides enough flex to follow any contours when filleting. The knife has an exceptional ultra-premium G-10 handle well-engineered to provide you with a comfortable grip and superior hand control. In addition, the handle is well designed to withstand cold and hot temperature without breaking. This shogun series fillet knife comes with a sheath to ensure your fingers are adequately protected when not in use. Dalstrong offers a terrific warranty in its money back guarantee and lifetime warranty against defects. Rapala is a favorite brand that is trusted worldwide. If you want to invest in a Rapala knife, you should consider this one as it features a full-tang stainless steel blade which is stain-free and corrosion resistant. The knife has a well-reinforced birch vanished handle that provides a lot comfort and maximum control while filleting. This knife is designed with a 4’’inch thin blade which is flexible to cut right through fish meat and bone smoothly. 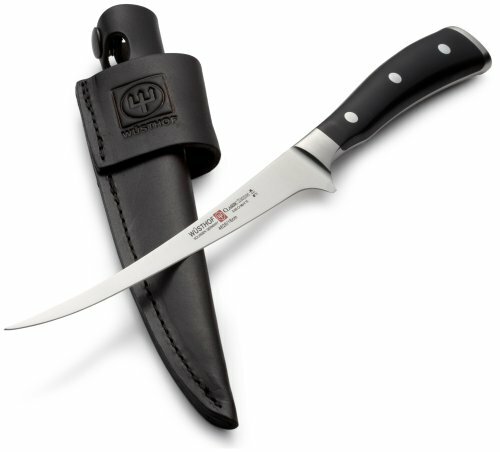 For optimal protection and sharpness when not in use, it comes with a high-quality leather sheath and a handy sharpener. If you’re an angler or chef that work with small or medium size fish, this is one suitable choice for you. This knife comes from a well-known brand made in ‘’the Cutlery Capital of the World’’ Solingen Germany. The Wusthof knife is perfectly designed with a 7.1inch flexible blade which makes deboning of your favorite fish much manageable. The blade is well proven for sharpness, and it is made from high carbon German steel that can resist stains and last longer even when used in a salty environment. The handle has a pleasing contour that can fit nicely in your hand for a comfortable grip. With a single purchase, you will get a leather belt loop sheath for optimal protection. The Rada is a great high quality fillet knife that needs to be owned by all fishermen and tucked away in their tackle box. It has an overall length of 12 inches and features a non-slip handle made from black rubber that allows you to use it comfortably even in the wettest environment. The blade which measures 7-1/8 inches is flexible enough to make deboning and filleting of fish easily. It is made from T420 high-grade carbon stainless steel that can be conveniently hand sharpened. This knife exceptionally standout as it offers you a lifetime guarantee with full replacement against defect in material. And the biggest plus is that it is inexpensive compared to others on the list. This knife features a razor-sharp Sandvik stainless steel blade which is remarkably robust, durable and corrosion resistance. 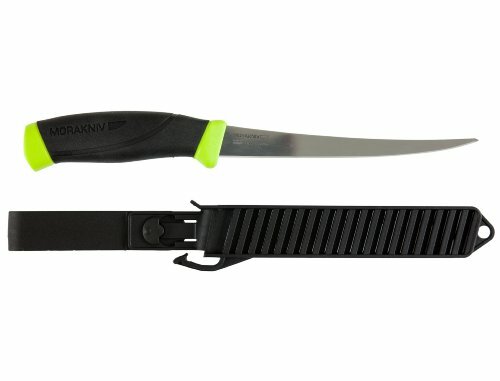 It offers a great deal as it comes with a slotted plastic sheath that is easy to clean and two interchangeable belt clips that allow users to either clip to or loop through their belt. The knife is available in two different blade lengths; one has a 6.1inch blade suitable for cleaning and filleting most sizes of fish, and the other has a 3.5-inch blade for deboning and for smaller panfish. The amazing part of this tool is that it has a high-friction handle that offers maximum control and steady grip. 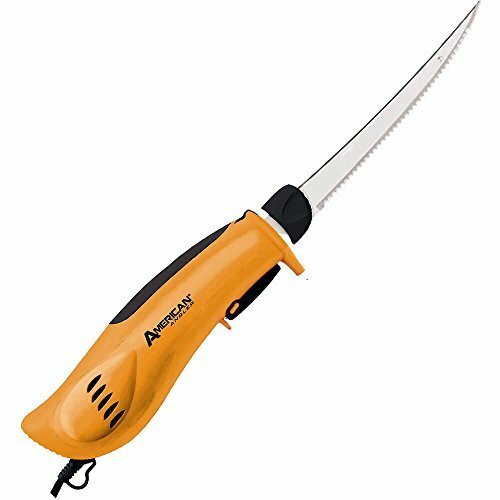 This American Angler knife is one of the toughest and most effective electric types that operate with a motor system to make filleting and deboning a lot easier and quicker. 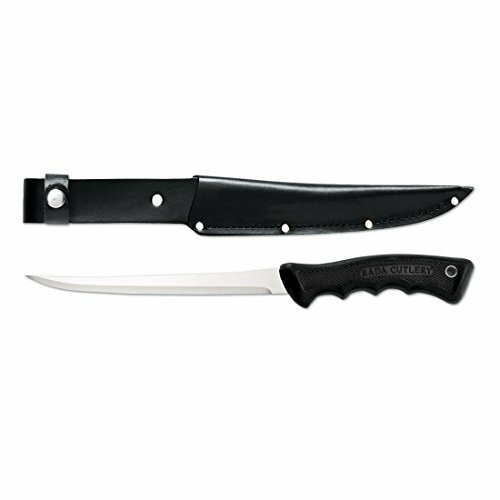 This heavy-duty knife features a replaceable 8-inch curve stainless steel blade that can perfectly cut right through large size fish with ease. It has an ergonomic handset that is perfectly designed with an inbuilt fan and advanced airflow handle that keeps it cool for hours while filleting. 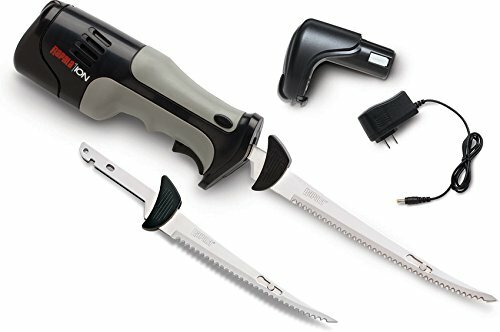 One exciting part of this knife is that you can change the blade, making it a suitable choice if you plan on catching different types of fish. If you’re looking for a good fillet knife that can separate fish or meat from its bone with precise control, this is one ideal choice for you. One of Switzerlands finest knife comes with a flexible 8-inch blade made from high carbon stainless-steel that offers maximum sharpness and edge retention. The blade is greatly ice tempered, for longer retention of its sharpness. It has a fibrox handle that is ergonomically designed, textured, and slip resistant to provide maximum balance and comfortable grip even when used with wet or moist hand. This knife is fully approved by the NSF (National Sanitation Foundation), and it comes with an excellent customer satisfactory benefit as it provides you with a lifetime warranty against manufacturer defects. This knife is another amazing product from Rapala but an electrical type this time. This heavy-duty Rapala fillet knife makes the hassle of deboning and filleting very easy as it provides you with three times more power than any other available electric knife. It has an 8 feet power cord that gives you maximum control when used around your fillet table. With this knife, you will certainly not get tired easily while filleting. The handle is ergonomically designed to fit all sizes of hands perfectly. The knife comes with a replaceable 7 ½ inch blade that offers the freedom to change the blade for any specific filleting purposes. A cordless heavy duty knife from Rapala which is perfectly designed with an advanced airflow body to prevent overheating. It comes with an essential kit which includes 2 rechargeable lithium-ion batteries, a flexible 6’’ and 7 ½ inch blade, and a wall charger that can be used to power up the battery if drained. With just a single charge; it can run for up to 80 minutes long without any interruption. 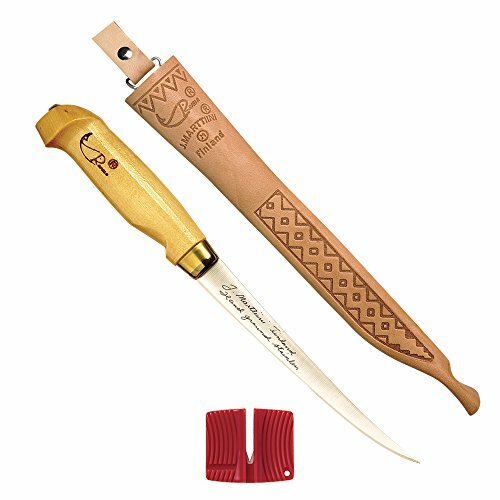 This knife has a well-crafted handle that provides a comfortable grip and eliminates any chance of tiredness while you are using it for long filleting session. The blade works great for filleting a lot of different fish of various sizes. 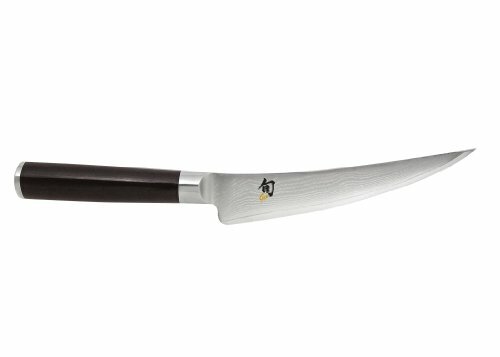 This boning and filleting knife from Shun is precisely forged in Japan by a renowned blade manufacturer known as KAI. Its blade is made of VG-10 stainless steel which is highly durable, and rust-free. On each side of the blade, it has a 33 layered Damascus detailing which helps to reduce drag when dicing and prevents morsel from sticking to the blade. The blade is 6 inches long and has a contour shape that makes it easy to efficiently debone and cut fish and meat without leaving any rough edges. This knife comes with a Pakkawood handle made from a perfect blend of hardwood veneer and resin. The handle is D-shaped that gives it a lot of balance and comfort for astable grip. It is recommended you wash it by hand to ensure all stains are removed. It is certain that using a quality knife makes filleting and boning a lot easier. Hopefully, we have listed some of the best fillet knife options with each offering something different to the buyer. Our reviews have given you a great insight on their different sizes, strength, thickness, types and what to expect in terms of your budget. ​Whichever knife you decide to shop for, it is best you look for the exclusive features that suit your personal needs.